Click here to go to links to all written lessons on Satan. Click here to go to the 5 minute video lectures. To Satan, under God, was committed upon earth the power of death (He. 2:14). Cast out of heaven as his proper sphere and ‘first estate,’ he still has access to God as the ‘accuser of the brethren’ (Re. 12:10) and is permitted a certain power of sifting or testing the self-confident and carnal among believers (Job 1:6-11; Lk. 22:31-32; 1 Co. 5:5; 1 Ti. 1:20) but this is strictly permissive and limited power, and believers so sifted are kept in faith through the advocacy of Christ (Lk. 22:31-32; 1 Jn. 2:1). The vision of Satan in Ezekiel 28, as we have seen, is not of Satan in his own person, but of Satan fulfilling himself in and through an earthly king who arrogates to himself divine honours, so that the prince of Tyrus foreshadows the beast (Dan. 7.8; Rev. 19.20).” Individuals, families, and churches are also targeted by Satan and his demons, as we learned in lesson 3. Satan’s privilege of access to God as accuser will someday be withdrawn (Re. 12:7-12). At the return of Christ in glory Satan will be bound for one thousand years (Rev. 20:2) after which he will be ‘loosed for a little season’ (Rev. 20:3, 7-8) and will become the head of final effort to overthrow the kingdom. Defeated in this, he will be finally cast into the lake of fire, his final doom. The notion that he reigns in hell is Miltonic, not biblical. He is prince of this present world-system, but will be tormented in the lake of fire.”Except for a remnant, individuals, families, churches, and nations choose the principles of Satan over the principles of God. The believer is also told, “Put on the whole armour of God, that ye may be able to stand against the wiles of the devil. For we wrestle not against flesh and blood, but against principalities, against powers, against the rulers of the darkness of this world, against spiritual wickedness in high places. Ephesians 6:13 Wherefore take unto you the whole armour of God, that ye may be able to withstand in the evil day, and having done all, to stand.” (Ep. 6:11-13). The Adamic Covenant, the covenant God made with Adam at the fall, promised the ultimate destruction of Satan through the “Seed of the woman.” Then began his long warfare against the work of God in behalf of humanity, which still continues. Satan is a murderer and a liar, the father of lies (Jn. 8.44). He blinds people to the truth. “But if our gospel be hid, it is hid to them that are lost: In whom the god of this world hath blinded the minds of them which believe not, lest the light of the glorious gospel of Christ, who is the image of God, should shine unto them” (2 Co. 4.3-4). At the same time Satan is blinding people to truth, he indoctrinates people into his world principles. The world system is Satan’s work. The “order,” “arrangement” under which Satan has organized the world of unbelieving mankind upon his principles of force, greed, selfishness, ambition, and sinful pleasure is imposing and powerful with armies and fleets; is often outwardly religious, scientific, cultured, and elegant; but, seething with national and commercial rivalries and ambitions, is upheld in any real crisis only by armed force, and is dominated by satanic principles. The world system was the bribe which he offered to Christ (Mt. 4:8-9). Of that world-system he is prince (Jn. 14:30; 16:11) and god (2 Cor. 4:4). As ‘prince of the power of the air’ (Ep. 2:2) Satan is at the head of vast host of demons. Demons are spirits (Mt. 12.43, 45); and Satan’s emissaries ((Mt. 12.26, 27; 25.41). They are so numerous as to make Satan’s power practically ubiquitous (Mk. 5.9). They are capable of entering and controlling both men and beasts and earnestly seek embodiment, without which, apparently, they are powerless for evil (Mt. 12.43-44; Mk. 5.10-12). Demon influence and demon possession are discriminated in the New Testament. 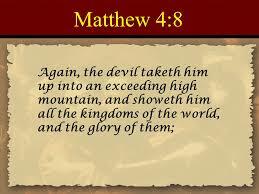 Instances of the latter are Matthew 4.24; 8.16, 28, 33; 9.32; 12.22; Mark 1.32; 5.15, 16, 18; Luke 8.36; Acts 8.7; 16.16. Demons are unclean, sullen, violent, and malicious (Mt. 8.28; 9.33; 10.1; 12.43; Mk. 1.23; 5.3-5; 9.17-20; Lk. 6.18; 9.39). They know Jesus Christ as Most High God and recognize His supreme authority (Mt. 8.31-32; Mk. 1.24; Ac. 19.15; Ja. 2.19). They know their eternal fate to be one of torment (Mt. 8.29; Lk. 8.31). They inflict physical maladies (Mt. 12.22; 17.15-18; Lk. 13.16). But mental disease it to be distinguished from the disorder of mind due to demonical control. Demon influence may manifest itself in religious asceticism and formalism (1 Ti. 4.1-3), degenerating in uncleanness (2 Pe. 2.10-12). The sign of demon influence in religion is departing from the faith, that is the body of revealed truth in scriptures (1 Ti. 4.1). That demons maintain especially a conflict with believers who would be spiritual (Ep. 6.12; 1 Ti. 4.1-3). All unbelievers are open to demon possession (Ep. 2.2). The resources of the believer are prayer and bodily control (Mt. 17.21), “the whole armour of God” (Ep. 6.13-18). Exorcism in the name of Jesus Christ (Ac. 16.18) was practiced for demon possession. One of the awful features of the apocalyptic judgements in which this age will end is an irruption of demons out of the abyss (Re. 9.1-11). The language in Ezekiel 28.1-19 goes beyond the king of Tyre to Satan, once Lucifer, inspirer and unseen ruler of all such pomp and pride as that of Tyre. [i] In Ezekiel 28, the vision is not of Satan in his own person, but of Satan fulfilling himself in and through an earthly king who arrogates to himself divine honors so that the Prince of Tyrus foreshadows the combining of all national governments with the religion of Satan (establishments which combine Satan’s tactics and goals through combinations of church (religion) and state); and the beast system which will be established in the end times (Da. 7.9; Re. 19.20). The continuous working of the mystery of lawlessness under divine restraint which had already begun in the apostle’s time and will continue until the last days (v. 7). Satan, the devil, goes about on this earth, “as a roaring lion seeking whom he may devour” (1 Pe. 5.8). The apostasy of the professing church ( 2 Th. 1:3; 18:8; 2 Ti. 3:1-8). the removal of that which restrains the mystery of lawlessness (vs. 6-7). The restrainer is a person–“he,” and since a “mystery”[ii] always implies a supernatural element. this Person can be none other than the Holy Spirit in the church, to be “taken out of the way” (v. 7). The manifestation of the lawless one (vs. 8-10; 7:8; 9:27; Mt. 24:15; Re. 13:2-10). The coming of Christ in glory and the destruction of the lawless one (v. 8; 19:11-21). The day of Jehovah (vs. 9-12; 2:12). The beast will establish the final and ultimate ecclesiastical and governmental tyranny described in Daniel 7.9, 11 and Revelation 13. To the beast Satan will give the power which he offered to Christ (Mt. 4.8, 9; Re. 13.4). All but the remnant will worship the dragon (Satan) which gave power unto and the beast; and they will worship the beast. The beast will continue forty-two months. During that time, he will speak great things and blasphemies against God, his tabernacle, and them that dwell in heaven. He will be given power to make war with the saints and to overthrow them. Everyone “whose names are not written in the book of life of the Lamb slain from the foundation of the world” will worship him. (Re. 13.3-9). The false prophet in Revelation 13.11-18, antichrist, with “all the power of the first beast before him,” will cause “the earth and them which dwell therein to worship the first beast….” He will deceive those on the earth by miracles. He will tell those on the earth to make an image to the beast. “And he causeth all, both small and great, rich and poor, free and bond, to receive a mark in their right hand, or in their foreheads: And that no man might buy or sell, save he that had the mark, or the name of the beast, or the number of his name” (vs. 16-17). Political Babylon will destroy ecclesiastical Babylon, which is apostate Christendom, headed up under the Papacy (Re. 18). Finally, “the beast, and the kings of the earth, and their armies” will gather “together to make war” against Christ and his army. “And the beast [will be] taken, and with him the false prophet that wrought miracles before him, with which he deceived them that had received the mark of the beast, and them that worshipped his image. These both [will be] cast alive into a lake of fire burning with brimstone” (Re. 19.20). Christ will cast that old serpent, Satan, “into the bottomless pit, and shut him up, and set a seal upon him, that he should deceive the nations no more, till the thousand years should be fulfilled” (Re. 20.2-3). Finally, after Christ’s millennial reign, Satan will be loosed for a little season to go out and deceive the nations and gather them to battle (Re. 20.3, 7-9). Fire will come “down from God out of heaven and devour them.” Satan will then be “cast into the lake of fire and brimstone, where the beast and false prophet are and shall be tormented day and night for ever and ever” (Re. 20.9-10). For our purposes in this study, keep in mind that the spirit of antichrist is working within the world today, against individuals, families, churches and civil governments (nations). Never forget that Satan is the God of this world. [iv] When a church, for example, combines the things of Satan, the temporal and earthly, with the spiritual, eternal, and heavenly that church has combined the things of Satan with the things of God thereby polluting the body of Christ and starting down the road to apostasy. Dear believers, please continue studying these lessons as they put in place all the pieces of a puzzle, a complete picture of God’s desired relationship of church and state and Satan’s counterfeit of that relationship. [i] Other instances of God indirectly addressing Satan are seen in Ge. 3.14, 15 and Mt. 16.23. [ii] A “mystery” in Scripture is a previously hidden truth, now divinely revealed; but in which a supernatural element still remains despite the revelation. Sometime long ago, even before God created the heavens and the earth, God created Lucifer. God gave Ezekiel a vision of Lucifer, before his fall and in his God-ordained place. “Thus saith the Lord GOD; Thou sealest up the sum, full of wisdom, and perfect in beauty. Thou hast been in Eden the garden of God; every precious stone was thy covering, the sardius, topaz, and the diamond, the beryl, the onyx, and the jasper, the sapphire, the emerald, and the carbuncle, and gold: the workmanship of thy tabrets and of thy pipes was prepared in thee in the day that thou wast created. Thou art the anointed cherub that covereth; and I have set thee so: thou wast upon the holy mountain of God; thou hast walked up and down in the midst of the stones of fire. Thou wast perfect in thy ways from the day that thou wast created, till iniquity was found in thee.” (Ez. 28.11-15). Satan’s pride took hold and he placed his will above God’s will. He rebelled against God, thereby introducing sin into the universe. “How art thou fallen from heaven, O Lucifer, son of the morning! how art thou cut down to the ground, which didst weaken the nations! For thou hast said in thine heart, I will ascend into heaven, I will exalt my throne above the stars of God: I will sit also upon the mount of the congregation, in the sides of the north: I will ascend above the heights of the clouds; I will be like the most High. Yet thou shalt be brought down to hell, to the sides of the pit. They that see thee shall narrowly look upon thee, and consider thee, saying, Is this the man that made the earth to tremble, that did shake kingdoms; That made the world as a wilderness, and destroyed the cities thereof; that opened not the house of his prisoners” (Is. 14.12-17)? Notice Satan’s five “I wills” in the verses quoted above. His “I will” (Is. 14:13) marks the introduction of sin into the universe. Cast out of heaven (Lk. 10:18) he makes earth and air the scene of his tireless activity (Eph. 2:2; 1 Pet. 5:8). After the creation of man he entered into the serpent. (Ge. 3:1) and, beguiling Eve by his subtlety, secured the downfall of Adam and through him of the race, and the entrance of sin into the world of men (Ro. 5:12-14). After his fall, Satan began to war against God through God’s highest creation, man. 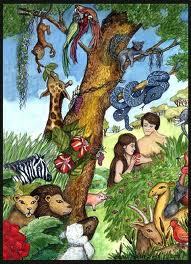 His assault on God began in the Garden of Eden. His tactics succeeded, so he thought. Satan seduced Eve with the same temptation whereby he was tempted: “I will be like the most High.” He said to Eve:” “For God doth know that in the day ye eat thereof, then your eyes shall be opened, and ye shall be as gods, knowing good and evil” (Ge. 3.5). At the fall, Satan became the God of this world. From that moment on, Satan has carried on a relentless attack against God through God’s highest creation, man, and against all those institutions ordained by God—the individual, the family, the nations (civil governments), and the church. God has never hidden his plans from Satan. God let Satan know about the coming Messiah. God said to Satan, “And I will put enmity between thee and the woman, and between thy seed and her seed; it shall bruise thy head, and thou shalt bruise his heel” (Ge. 3:15)(By “her seed” and “his heel” God was referring to the Lord Jesus Christ). Throughout the Old Testament, we see Satan’s attempts to destroy the line leading to the Lord Jesus. He never succeeded, but he continues to war against God. Satan knows that if he can prove God wrong about his plans at any point before he is cast into the lake of fire, he will have defeated God. In the next lesson, we will look at the Satanic Beast System and the Fate of the Beast. The system was already at work in the beginning days of the New Testament church. Click here to go to all lessons on Civil Government. Click here to go to the 5 to 8 minute video lectures. A second purpose can be inferred from an admonition of Paul to Timothy—to organize society under God, that is according to God’s principles. A nation under God will base its law upon biblical principles and such a civil government teaches its citizens the biblical principle that they have freedom of conscience,[viii] but that individuals should choose to conform their wills to the will of God. As will be seen in future lessons, everyone in such a nation may choose the one true God, god, gods, or no gods at all; this will be very important as our studies take us to the History of the First Amendment, the History of Religious Freedom, in America. The covenant God made with Noah was written to Gentile nations. 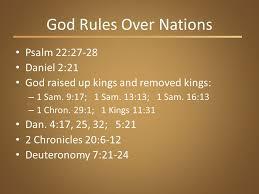 Gentile nations were to always proceed under God’s original plan for civil government. 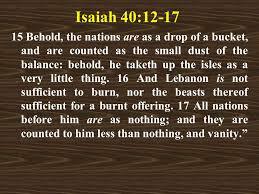 Later, as will be shown, God called out a nation, Israel, for specific purposes applicable only to that one nation. Israel was to operate as a theocracy directly under God. Israel was to be the center of God’s dealings with nations. God’s treatment of every Gentile nation depended and depends upon that nation’s treatment of Israel. [i] See 1 Ti. 2.1-6. [ii] Ro. 13.3-4; see also, 1 Pe. 2.13-14; 1 Timothy 1.9-11. [v] Eidsmoe, God and Caesar, p. 8. [vii] Mark Douglas McGarvie, One Nation Under Law: America’s Early National Struggles to Separate Church and State (DeKalb, Illinois: Northern Illinois University Press, 2005), p. 12. [viii] See History of the First Amendment. Click here to go to all lessons on the Bible Doctrine of Government. Note. Footnotes quote numerous supporting verses. God judges nations. He judged Israel by sending Israel and Judah into captivity because of their repeated failure, despite many warnings from God, to keep His commandments and His statutes. He warned them in advance of what he was going to do. His prophets repeatedly warned the Jews, not only of the consequences of their sins, but also pointed out their specific sins. God’s Old Testament prophets warned Israel over and over of coming judgments. The test for a Gentile nation, as always, is the way a nation treats Israel. “And I will make of thee [Israel] a great nation, and I will bless thee, and make thy name great; and thou shalt be a blessing; And I will bless them that bless thee, and curse him that curseth thee: and in thee shall all families of the earth be blessed.” “Let people serve thee, and nations bow down to thee: cursed be every one that curseth thee, and blessed be he that blesseth thee.” “He couched, he lay down as a lion, and as a great lion: who shall stir him up? Blessed is he that blesseth thee, and cursed is he that curseth thee.” Nations that blessed Israel have invariably been blessed, those that have persecuted Israel have suffered ill. A careful study of ancient history and of current events reveals that disaster follows when a nation “curses” the nation Israel. The whole world system, made up of the Gentile nations after the dispersion of the Jews, fell into and will remain in confusion until the Lord returns, conquers the nations with a crushing blow, and sets up His kingdom. Ultimately, Christ will return and gather the nation Israel, the “the apple of the eye of the Lord of hosts,” from all nations where He has scattered them, and bring them into the land He has given them: “Thus saith the LORD of hosts: Behold, I will save my people from the east country, and from the west country; And I will bring them, and they shall dwell in the midst of Jerusalem: and they shall be my people, and I will be their God, in truth and in righteousness.” He will establish His kingdom by power, not persuasion. This will be after the divine judgment upon the Gentile world powers. In addition to His treatment of Israel at His return, Christ will destroy the present political world-system and judge the nations. Then there will follow world-wide Gentile conversion and participation in the blessings of the kingdom. (1) We are now at the end of the times of the Gentiles. The end began in 1948 when Israel became a nation. A nation was born in one day. The return was a miraculous event fulfilling the scripture that a nation would be ‘Born in a day:’ ‘Who hath heard such a thing? who hath seen such things? Shall the earth be made to bring forth in one day? or shall a nation be born at once? for as soon as Zion travailed, she brought forth her children.’ They returned in unbelief; the Prophet Ezekiel foretold this return of the Jews without God, trusting in their own strength. Without the Holy Spirit the Jews are nothing but ‘dry bones.’ The yearning in the heart of the Jews for their land—‘Next Year in Jerusalem’—has been the watch cry of Jews for 2000 years. They started going back at the beginning of the 13th Century because of persecution. A trickle in the beginning has reached around 5 million today. Israel is returning to the land in unbelief. ‘Now learn a parable of the fig tree; When his branch is yet tender, and putteth forth leaves, ye know that summer is nigh: So likewise ye, when ye shall see all these things, know that it is near, even at the doors. Verily I say unto you, This generation shall not pass, till all these things be fulfilled. Heaven and earth shall pass away, but my words shall not pass away.’ The fig tree is Israel.” (2) Invasion of Israel by Russia and Moslem allies –– Magog (Rosh), Meshech (Moscow-Eastern Capitol), Tubal –(Western Capitol), Persia – (Iran), Ethiopia, Libya, Gomer-(Southern Russia), Togarmah. This alliance includes Russia, Iran (Persia) and their Moslem allies. These nations will be miraculously defeated by Israel. “(3) The invasion of Palestine by Gentile world powers headed up under the Beast and false prophet. (4) The destruction of the invaders by the Lord’s army, and the repentance of Judah in the land. (5) The answer of Jehovah. (6) The pouring out of the Spirit. (7) The return of the Lord in glory and the setting up of the kingdom by the regathering of the nation and the judgment of the nations. (8) Full and permanent kingdom blessing. “… [F]or the LORD hath a controversy with the inhabitants of the land, because there is no truth, nor mercy, nor knowledge of God in the land. By swearing, and lying, and killing, and stealing, and committing adultery, they break out, and blood toucheth blood. Therefore shall the land mourn, and every one that dwelleth therein shall languish, with the beasts of the field, and with the fowls of heaven; the fishes of the sea also shall be taken away…. (Ho. 4.1-3).” Israel was willfully ignorant: “… because thou hast rejected knowledge, I will also reject thee, that thou shalt be no more priest to me: seeing thou hast forgotten the law of thy God, I will also forget thy children…” (Ho. 4.6-11). God reminds Israel through his prophet Amos of all His judgments against Israel and in spite of those judgments, “yet have ye not returned unto me, saith the LORD.” God says, “Prepare to meet thy God, O Israel” (Amos 4.6-13 (part of verses 10 and 12 quoted)). God wanted Amos to preach 3 things to Israel: (1) the people did not respect the preaching of the word of God; (2) Israel did not honor the Sabbath (Amos 8.5); (3) they did not detest sin any more (Amos 8.14). God also wanted Amos to tell Israel exactly what he was about to do. They rejected his message. In fact, they didn’t even want to hear him preach. They rebelled at the message and the messenger. “The wicked shall be turned into hell, and all the nations that forget God. Put them in fear, O LORD: that the nations may know themselves to be but men. Selah” (Ps. 9.17, 20). “For the LORD most high is terrible; he is a great King over all the earth. He shall subdue the people under us, and the nations under our feet” (Ps. 47.2-3). Psalm 135.6-12. “Whatsoever the LORD pleased, that did he in heaven, and in earth, in the seas, and all deep places…. 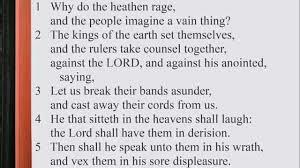 Who smote great nations, and slew mighty kings; Sihon king of the Amorites, and Og king of Bashan, and all the kingdoms of Canaan…” (Ps. 135.6, 10-11). “To him which smote great kings: for his mercy endureth forever; And slew famous kings, for his mercy endureth forever; [kings named]” (Ps. 136.17-21). God used Assyria to judge Israel and then judged Assyria for its pride in boasting that Assyria did this (Is. 10.5-19). See Ge. 15.13, 14; De. 30.5-7; Is. 14.1, 2; Joel 3.1-8; Mic. 5.7-9; Mt. 25.31-40. See John McTeman and Bill Koenig, Israel: The Blessing or the Curse (Oklahoma City, Oklahoma: Heathstone Publishing, 2002), cited in William P. Grady, How Satan Turned America Against God (Knoxville, Tennessee: Grady Publications 2005), pp. 1-13. 2 Chr. 36.1-21; Je. 38.7; Mt. 21.24 (speaking of the time after the destruction of Jerusalem in 70 A.D.). Da. 2.45, Da. 7.9-11; Re. 19.11-21. Zec. 8.7-8. See also, Zec. 8.1-8, De. 30.1-9 (God declared the Palestinian Covenant), P. 110, Ro. 11.25-27. Da. 2.34, 35; Re. 19.11-21. “Then shall he speak unto them in his wrath, and vex them in his sore displeasure. Yet have I set my king upon my holy hill of Zion. I will declare the decree: the LORD hath said unto me, Thou art my son; this day have I begotten thee. Ask of me, and I shall give thee the heathen for thine inheritance, and the uttermost parts of the earth for thy possession” (Ps. 2.5-8). “And it shall come to pass in the last days, that the mountain of the LORD’S house shall be established in the top of the mountains, and shall be exalted above the hills; and all nations shall flow into it. And many people shall go and say, Come ye, and let us go up to the mountain of the LORD, to the house of the God of Jacob; and he will teach us of his ways, and we will walk in his paths: for out of Zion shall go forth the law, and the word of the LORD from Jerusalem. And he shall judge among the nations, and shall rebuke many people: and they shall beat their swords into plowshares, and their spears into pruninghooks: nation shall not lift up sword against nation, neither shall they learn war any more” (Is. 2.2-4). “And in that day there shall be a root of Jesse, which shall stand for an ensign of the people; to it shall the Gentiles seek: and his rest shall be glorious” (Is. 11.10). “And the Gentiles shall come to thy light, and kings to the brightness of thy rising” (Is. 60.3). “Thus saith the LORD; I am returned unto Zion, and will dwell in the midst of Jerusalem: and Jerusalem shall be called a city of truth; and the mountain of the LORD of hosts the holy mountain…. Thus saith the LORD of hosts; It shall come to pass, that there shall come people, and the inhabitants of many cities: … Thus saith the LORD of hosts; In those days it shall come to pass that ten men shall take hold out of all languages of the nations, even shall take hold of the skirt of him that is a Jew, saying, We will go with you: for we have heard that God is with you” (Zec. 8.3, 20, 23). 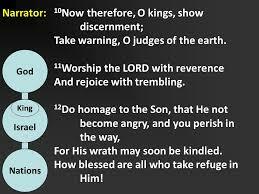 “And it shall come to pass, that every one that is left of all the nations which came against Jerusalem shall even go up from year to year to worship the King, the LORD of hosts, and to keep the feast of tabernacles. And it shall be, that whoso will not come up of all the families of the earth unto Jerusalem to worship the king, the LORD of hosts, even upon them shall be no rain. And if the family of Egypt go not up, and come not, that have no rain; there shall be the plague, wherewith the LORD will smite the heathen that come not up to keep the feast of tabernacles. This shall be the punishment of all nations that come not up to keep the feast of the tabernacles. In that day shall there be upon the bells of the horses, HOLINESS UNTO THE LORD; and the posts in the LORD’S house shall be like the bowls before the altar. Yea, every pot in Jerusalem and in Judah shall be holiness unto the LORD of hosts: and all they that sacrifice shall come and take of them, and seethe therein: and in that day there shall be no more the Canaanite in the house of the LORD of hosts” (Zec. 4.16-21). “For then [in context, after the Lord crushes the nations] will I turn to the people a pure language, that they may all call upon the name of the LORD, to serve him with one consent” (Zep. 3.9). “And to this agree the words of the prophets: as it is written, After this I will return, and will build again the tabernacle of David, which is fallen down; and I will build again the ruins thereof, and I will set it up: That the residue of men might seek after the Lord, and all the Gentiles, upon whom my name is called, saith the Lord, who doeth all these things” (Ac. 15.15-17). “And I saw the beast, and the kings of the earth, and their armies, gathered together to make war against him that sat on the horse, and against his army. And the beast was taken, and with him the false prophet that wrought miracles before him, with which he deceived them that had received the mark of the beast, and them that worshipped his image. These both were cast alive into a lake of fire burning with brimstone. And the remnant were slain with the sword of him that sat upon the horse, which sword proceeded out of his mouth: and all the fowls were filled with their flesh. And I saw an angel come down from heaven, having the key of the bottomless pit and a great chain in his hand. And he laid hold on the dragon, that old serpent, which is the Devil, and Satan, and bound him a thousand years, And cast him into the bottomless pit, and shut him up, and set a seal upon him, that he should deceive the nations no more, till the thousand years should be fulfilled: and after that he must be loosed a little season. And I saw thrones, and they sat upon them, and judgment was given unto them: and I saw the souls of them that were beheaded for the witness of Jesus, and for the word of God, and which had not worshipped the beast, neither his image, neither had perceived his mark upon their foreheads, or in their hands; and they lived and reigned with Christ a thousand years. But the rest of the dead lived not again until the thousand years were finished. This is the first resurrection. Blessed and holy is he that that part in the first resurrection: on such the second death hath no power, but they shall be priests of God and of Christ, and shall reign with him a thousand years” (Re. 19.19-20.6). Joel 2.1-10, 18-20; “Armageddon:” Re. 16.13-16; Zec. 12.1-9. Ps. 2.10-12. See Psalm 2 in its entirety. Is. 40.15, 17, 22-24, 26. Je. 7.28. See the entirety of Je. 7. Roger Williams and Edward Bean Underhill, The Bloudy Tenent of Persecution for Cause of Conscience Discussed and Mr. Cotton’s Letter Examined and Answered (London: Printed for the Society, by J. Haddon, Castle Street, Finsbury, 1848), p. 100. John Eidsmoe, Christianity and the Constitution: The Faith of Our Founding Fathers (Grand Rapids, Michigan: Baker Book House, 1987), p. 309, quoting Patrick Henry, Virginia Ratifying Debates; quoted by Tyler, Patrick Henry, p. 328.